There are things about ministry that can only be learned through experience. There are things about ministry that will only be learned through formal education. We need both! While we treasure our educational opportunities, it is not reasonable to expect a few years at an academic institution to prepare us for a lifetime of ministry. We must be lifelong learners. Ministry is hard and it gets harder all the time. That most people are a joy with whom to work. That you need 10 encouragements for every one discouragement. Preaching is vitally important, but it may not be the most important aspect of ministry. That emotional intelligence is one of your greatest assets; in fact, you will fail without it. That one of the most important things a minister can say is, “I was wrong, I am sorry.” Apologize quickly, sincerely, and often. As a pastor, your heart is revealed more by your prayer than by your preaching. The skill of leading change is a non negotiable. Avoid the trap of dividing your church with politics. The responsible use of social media. The absolute necessity of cultural diversity in ministry. How important it is to stay in good physical condition. How important a retirement plan is. If you don’t observe Sabbath, you are a sinner! If you are counting, you realize I have 15 items on the list. Perhaps it is akin to the preacher who thinks he preached for 30 minutes when he actually preached for 1 hour. So, number 16 might be: Learn how to count and to tell time. Your word matters. Having served as a local church pastor for over 25 years, I have had more than my share of people who left the church I was serving. I am ashamed of the number of people who quit the church under my leadership. It was never pleasant, it always hurt and, with the exception of a couple of very dysfunctional people, I was very sad as a result of their departure. In the numerous conversations that took place around these departures, most of the talk centered around the concept of people “leaving the church.” Usually people just stopped showing up. A few times, they informed me personally why they were leaving. I have received emails, text messages and phone calls telling me they were quitting the church. Facebook messenger, grapevine and cryptic messages on the church answering service have also worked well. But I can’t recall anyone telling me that they were quitting me, the pastor. But in essence, that is what many of them did. Complaints by those who leave a church vary. Some involve talk about the music; others cite the lack of programs for their kids. Conflict is a major cause of people leaving the church. Rarely does doctrine come into play. On most occasions, it’s an issue of style or preference or opinions about the operation of the church. The reason I say that people leave a pastor rather than the church is, all of these things are (or should be) under the influence of the primary leader – the pastor. While the pastor shouldn’t run everything in the church, as the primary leader, their philosophy is, in most cases, most predominant. Most people who leave, leave the Pastor. As a Lead Pastor, if there is an issue in the Youth Ministry, it is my issue. If the music is bad, I own it. If the nursery is dirty, I am to blame. Of course, I am not a proponent of the Lead Pastor doing all of the work. In fact, a micromanaging pastor is a reason why some some leave a church. But the Pastor must provide a level of leadership that influences the entire church. Regardless of how many people tell me, “don’t take it personally”, it is very personal when people leave. When you pour your life into a group of people, it is silly to think that it is not personal; of course it is. Today, as a church denominational leader, when someone leaves our group, it is personal. People don’t leave our movement; they leave the leader. It’s personal for everyone – if it’s not, your heart has already departed. I’ll never get accustomed to the pain of losing people. If I do, I am in dereliction of my duty. I can’t fix everything. And sometimes people need to leave a church. But let’s not try to fool ourselves into believing that, in many cases, the pastor is not responsible. For clarification, I am not writing this blog post to make pastors feel even worse than they already do. That is the farthest thing from my motivation. I am writing this to let people know, leaving a church is a very painful and personal issue for many people. It hurts. Please don’t leave assuming it doesn’t matter to anyone; It does. If a pastor is being honest, it hurts them deeply. I hope we can see a way to avoid this trend – and yes, it is a trend. 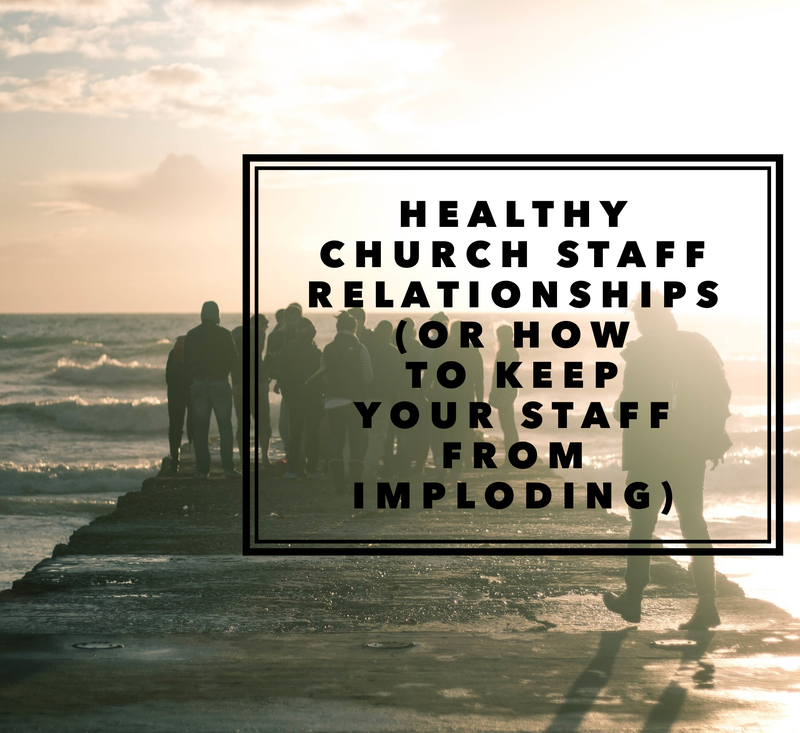 My advice would be to engage in healthy communication with the pastor long before you make a decision to leave. Perhaps it won’t work, but just maybe it will. And finally, Pastors, I love you, but we must own this concept. We simply can’t exonerate ourselves when numerous people leave the church. You may not be directly to blame but, as the shepherd, you are in most cases responsible if the flock scatters. How about if we stick together and work toward making the church as good and effective as it can possibly be? Working well with other leaders and staff members is essential for ministry success. Having worked with paid church staff for over 20 years, I believe that this is more challenging than working with church members or volunteers. In fact, I think it’s generally easier to pastor 100 people alone than 200 people with a team. Because of this, some churches avoid hiring staff. I have friends who purposely keep their ministry small and manageable. I disagree with this approach and believe the benefits of working with staff far outweigh the challenges. On the contrary, I know a few smaller church leaders who can’t wait for the day when they have staff – so their jobs won’t be so hard. You, my friend, are mistaken. Church staff relationships are tricky, to say the least. We must figure this out because if the staff is broken, the church is broken. Jealousy of the success of others (this reveals spiritual immaturity and insecurities). Sharing limited resources (there is only so much money and volunteers to go around). Staff members sometimes fight over support. Undermining others in an effort to look better. We must realize that, as a team, when one of us wins, we all win and when one of us loses, we all lose. Lack of loyalty to the mission and vision of the church/senior leader. Some staff members have secret ambitions to take their boss’ job. So, how do we prevent these threats from doing irreparable damage to our church staff? Hire spiritually mature people. Regardless of one’s ability, if there is a weakness in one’s spirituality, it will reveal itself in a church staff setting. Create open and honest communication among the staff. Freedom to address perceived issues will allow a staff to address problems as they arise, rather than allowing them to build up over time. The primary leader must stay personally engaged with the staff. While another staff member may be the first point of contact on a larger staff, the leader must be accessible and in relationship with team members. Personal as well as professional relationships must be intentionally developed. A staff that dislikes one another outside of church will dislike one another inside of the church. Staff prayer is vitally important. This prayer should be scheduled, frequent and treated as a priority. Required reading. The staff should read and discuss current leadership development materials.The church staff should celebrate individual victories as a team and mourn individual losses as a team. These are just a few ideas on how we may prevent threats to the church staff from destroying the staff (and church). I’d be interested to hear your ideas. Healthy church staffs result in healthy churches. And God wants a healthy Church!